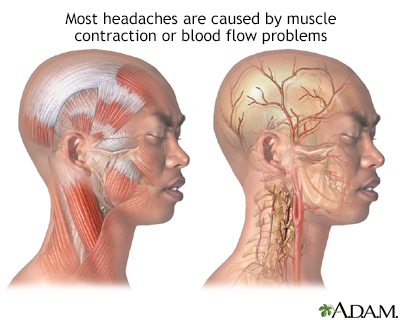 Tension-type headaches are the most common type of headache, accounting for about half of all headaches. The pain is usually mild-to-moderate in intensity, with a steady pressing or tightening quality (like a vise being squeezed around the head). The headache is not accompanied by nausea or vomiting, and the pain is not increased by routine physical activity such as walking or climbing stairs. A tension-type headache attack can last anywhere from 30 minutes to an entire week. Women are slightly more likely to get tension-type headaches than men. Nearly everyone will have at least one tension-type headache at some point in their lives and more than a third of people will experience a tension headache each year. Many people who have migraine headaches also have tension-type headaches. What Is The Difference Between Tension-Type Headaches and Migraine Headaches? Migraine pain is usually throbbing while tension-type headache pain is usually a steady ache. Migraine pain often affects only one side of the head while tension-type headache pain typically affects both sides of the head. Migraine headaches, but not tension-type headaches, may be accompanied by nausea or vomiting, sensitivity to both light and sound. Tension headaches don't typically have a warning or aura. Treatment of tension-type headache focuses on relieving pain when attacks occur, and preventing recurrence of attacks. Most tension-type headache attacks respond to simple nonprescription pain relievers such as aspirin, ibuprofen (Advil, Motrin, generic), or naproxen (Aleve, generic). However, these medications, especially those that contain caffeine, should not be used more than twice a week because they can cause medication overuse (rebound) headaches. People who have two or more tension-type headache attacks each month should talk to their health care providers about preventive therapy. This may include a tricyclic antidepressant, such as amitriptyline (Elavil, generic), combined with behavioral therapies. Behavioral treatment approaches include relaxation therapy, biofeedback, stress management, and cognitive-behavioral therapy. Most people have had headaches. There are many different kinds of headaches, and they range from being an infrequent annoyance to a persistent, severe, and disabling medical condition. Tension-type headaches are among the most common of all headaches. The pain of a tension-type headache can range from mild to severe and last anywhere from a few minutes to several days. A headache is considered primary when it is not caused by another medical condition or disease. Most primary headaches fall into three main types: tension-type, migraine, and cluster headaches. Tension-type headache is the most common type of primary headache. Headaches can be caused by problems in the interaction of chemicals in the brain, nerve pathways, and blood vessels. Secondary headaches are caused by other medical conditions, such as sinus infections, neck injuries, and strokes. Headaches due to abnormalities or infections in the nasal or sinus passages are commonly referred to as sinus headaches. Click on the icon to see an image about headaches. Chronic headaches occur on more than 15 days per month and have been present for at least 6 months. About 25% of the time, episodic-type headaches evolve into chronic tension-type headaches. Short-duration headaches, or those lasting fewer than 4 hours. The most common short-acting chronic headaches are cluster headaches. Long-duration headaches, which last more than 4 hours. Tension-type headaches are the most common type of long-duration chronic headaches and are, in fact, the most common type of chronic headaches in general. Researchers are not sure what causes tension-type headaches. At one time, these headaches were blamed on abnormal muscle contractions but this theory has largely been discounted. This is why this headache's name has changed from "tension" to "tension-type." Researchers now think that tension-type headaches most likely occur due to an interaction of several factors that involve pain sensitivity and perception, as well as the role of brain chemicals (neurotransmitters). Several studies have shown abnormalities of serotonin levels in people with tension-type headaches. Some research has shown abnormal muscle activity in people with tension-type headache. Although muscle tightness does not necessarily cause tension-type headaches, certain triggers associated with muscle contractions or strain may contribute to this condition. Research indicates that people with tension-type headache may have abnormalities in the central nervous system that increase their sensitivity to pain. Tension-type headaches are associated with, and may represent an overlap of other pain syndromes such as fibromyalgia. The central nervous system includes the nerves in the brain and spine. Tension-type headaches may also be linked to myofascial trigger points in the neck and shoulder muscles. Myofascial pain involves the fascia (connective tissue) and muscles. Trigger points are knots in the muscle tissue that can cause tightness, weakness, and intense pain in various areas of the body. For example, a trigger point in the shoulder may result in headache. Neurotransmitters are chemical messengers in the brain. Several types of neurotransmitters affect how the brain reacts to pain stimulation. In particular, serotonin (also called 5-HT) and nitric oxide are thought to be involved in these chemical changes. Release of these chemicals may activate nerve pathways in the brain, muscles, or elsewhere and increase pain. People with tension-type headache are at increased risk of having depression. It isn't known if depression is a result of having headaches, or an underlying neurotransmitter problem results in both depression and tension-type headache. Many different factors can trigger or aggravate tension-type headaches. Stress certainly plays a role in tension-type headaches. Emotional and psychological factors that contribute to stress include anxiety, depression, and anger. Lifestyle factors include fatigue, lack of sleep, dehydration, and hunger. Sleep disorders, such as insomnia or obstructive sleep apnea, can trigger or worsen tension-type headaches. Working or sleeping in an awkward position can contribute to posture problems that affect muscles in the neck and shoulders. About a third of persistent headaches, including chronic migraine and tension-type, are medication-overuse headaches. They result from a rebound effect caused by the overuse of headache medications. Nearly any type of headache medication can produce this effect. This is true for medications that contain caffeine. Headaches can also occur after withdrawing from caffeine, nicotine, or alcohol. Jaw clenching or teeth grinding, during sleep, are signs of temporomandibular joint (TMJ) dysfunction. TMJ pain can occur in the ear, cheek, temples, neck, or shoulders. This condition often coexists with chronic tension headache. Some people with TMJ dysfunction may see improvement in tension-type headaches from procedures or exercise therapies that specifically address the dental condition. Click on the icon to see an image of temporomandibular joint dysfunction. Tension-type headaches are the most common type of headache. Nearly everyone has at least one tension-type headache during their lifetime. Episodic tension-type headaches are far more common than chronic tension-type headaches. Tension-type headaches are slightly more common in women than men. Tension-type headaches are most likely to occur among people in their 30s. They tend to occur less as people become older. Tension-type headaches occur more commonly in people with higher educational levels. Tension-type headaches are rare before age 4 but become more common throughout childhood, reaching a peak at around age 13, and occurring in as many as 48% of children according to some studies. Children with tension-type headaches often suffer from an accompanying emotional or psychological disorder. Sleep problems. Many children who experience chronic daily headaches suffer from sleep disturbances, especially difficulty falling asleep. Mental health conditions. Many children with chronic tension-type headaches also have depression or an anxiety disorder. Family stress. Stressful family events can contribute to emotional problems that lead to tension-type headaches. Problems at school. According to a National Headache Foundation survey, nearly 30% of children miss school because of headaches. For many children, the start of the school season can be a particularly stressful time. Keep a diary of your child's headaches noting time of onset, length and intensity of attack, location of pain, and dietary triggers. Make sure your child gets plenty of sleep at regular times. Avoid changes in your child's eating routine (hunger and eating at irregular times can trigger headaches). Discuss any headache concerns with your child's provider. Both episodic and chronic tension-type headache can affect quality of life. However, tension-type headache episodes are rarely disabling, and rarely require emergency treatment. If they do, there is usually a migraine component occurring with the tension-type headache. Although they are not medically dangerous, chronic tension headaches can have a negative impact on quality of life, social relations, and work productivity. Several studies have reported lower quality of life for people with any chronic daily headache compared to those with no headaches or only episodic ones. Many people with chronic tension-type headaches also suffer from anxiety and depression. Tension-type headaches can, in most cases, be treated and prevented. Episodes of these headaches can also resolve over time. In one study, nearly half of people with frequent or chronic tension-type headache were not experiencing headaches when examined 3 years later. People who have both tension-type and migraine headaches may face steeper challenges in recovery. The absence of other features helps differentiate tension-type headaches from other kinds of headaches. Migraine pain is usually throbbing, while tension-type headache pain is usually a steady ache. Migraine pain usually affects only one side of the head, while tension-type headache pain typically affects both sides of the head. Migraine pain, but not tension-type pain, worsens with head movement. Migraine headaches, but not tension-type headaches, may be accompanied by moderate-to-severe nausea and vomiting. Migraine headaches, but not tension-type headaches, may be accompanied by sensitivity to both light and sound. Migraine headaches may be accompanied by visual disturbances called auras. Tension-type headaches do not have auras. The diagnosis of tension-type headache is based on symptoms, medical history, and a physical exam. The provider may recommend you keep a headache diary to track the occurrence and intensity of headache attacks. For chronic, severe, or unusual headaches, the provider may conduct a neurological exam or order imaging tests. Duration and frequency of headaches. Type of pain (throbbing or steady pressure). Behavior during a headache. Different behaviors may help distinguish between migraine and tension headaches. People with tension headaches tend to relieve pain by massaging the scalp, temples, or the nape of the neck. People with migraines are more likely to press the forehead and temples or to apply a cold pack to the area. The provider will also ask about your general medical and family history, particularly concerning headaches or other neurological diseases. Keeping a headache diary is a useful way to identify triggers that bring on headaches, and to help differentiate between migraine and tension-type headache. Be sure to include all events preceding an attack. Often two or more triggers interact to produce a headache. Tracking medications is an important way of identifying medication-overuse headache. Many persistent headaches result from the rebound effect caused by the overuse of headache medications. The provider will examine the head and neck to check for muscle tenderness. The provider may also perform a neurologic examination, which includes a series of simple evaluations to test strength, reflexes, coordination, sensation, and mental function. The provider may also recommend an eye examination. Imaging tests look for any serious medical condition as the cause of headache. For people who have stable headaches, they are generally not recommended except for sudden new or worsening symptoms. For imaging tests, magnetic resonance imaging (MRI) is preferred over computed tomography (CT) scans because MRIs do not expose people to radiation. People with chronic headaches may, however, overlook a more serious condition believing it to be one of their usual headaches. You should immediately call your provider if your headache or other accompanying symptoms changes. Management of tension-type headaches focuses in the short term on treating attacks, and in the long term on preventing recurrence. In general, short-term treatment of tension-type headache involves drugs (mainly pain relievers) while long-term preventive measures include both drug and non-drug approaches. With medications, relaxation training, lifestyle changes, and other therapies, most headache pain can be relieved or reduced. Most episodic attacks of tension-type headaches get better without any treatment. Simple over-the-counter pain relievers such as acetaminophen (Tylenol, generic) or non-steroidal anti-inflammatory drugs (NSAIDs) can treat mild symptoms. Aspirin or ibuprofen (Advil, generic) is usually the first NSAID choices, followed by naproxen (Aleve, generic). Some people may also try medications that combine a pain reliever with caffeine. However, using combination medications that contain caffeine more than twice per week may cause rebound headache. Some people find massage therapy helpful for treating acute episodes of tension-type headache. Daily preventive treatment is recommended for people who experience at least 2 headache attacks a month. Preventive treatments do not work as well when people overuse pain-relief medication. Your provider may recommend stopping and withdrawing from painkillers before beginning preventive approaches. The goals of preventive treatment are to reduce the frequency and severity of headache attacks, and to improve the response to pain medication. Studies indicate that best results are achieved when drug treatment is combined with relaxation or stress-management training. Most headache drugs can be stopped abruptly, but be sure to check first with your provider. Certain non-headache medications, such as anti-seizure drugs, as well as some anti-anxiety drugs or beta-blockers, require gradual withdrawal under medical supervision. If you choose to taper off standard headache medications, withdrawal should be completed within 3 days or less. No matter which approach is used for stopping medication, there may be a period of worsening headache for a few days afterward. Alternative pain relievers may be administered during the first days to help withdrawal. Most people feel better within 2 weeks, although in some cases headache symptoms can persist up to 16 weeks (and in rare cases even longer). The standard treatments for episodic attacks of tension-type headaches are NSAIDs, such as aspirin and ibuprofen. The tricyclic antidepressant amitriptyline (Elavil, generic) is considered the most effective preventive medication for treating chronic tension-type headaches. Due to the risks of overuse and dependence, opioids, opioid-like drugs, and sedative hypnotics are not recommended for treatment of tension-type headaches. Pain relief medication is helpful for treating mild-to-moderate headaches. However, it cannot prevent headaches. There are many different types of pain relief medicine. Long-term use of high-dose NSAIDs may increase the risk for stomach bleeding and heart problems, including heart attack and stroke. Using NSAIDs more than twice a week may increase the risk for medication overuse (rebound) headache. Acetaminophen (Tylenol, generic) is a good alternative to NSAIDs when stomach distress, ulcers, or allergic reactions prohibit their use. A high dose (1,000 mg) is recommended for treating headaches. Acetaminophen does have some adverse effects, and the daily dose should not exceed 3 grams (3,000 mg). People who take high doses of this drug for long periods are at risk for liver damage, particularly if they drink alcohol and do not eat regularly. Acetaminophen may cause serious kidney problems in people who already have kidney disease. It also may interact with certain medications, including the blood thinner warfarin (Coumadin, generic). Tricyclics are the type of antidepressant most often used for prevention of severe chronic tension-type headaches. Tricyclics are used to treat depression but they can also help relieve muscle pain and improve sleep. Amitriptyline (Elavil, generic) is the tricyclic most commonly prescribed for prevention of tension-type headache. Nortriptyline (Pamelor, generic) and Imipramine (Tofranil, generic) are other tricyclics sometimes prescribed. A tricyclic antidepressant is usually started at a lower dose and then slowly increased. A headache diary can help you and your provider evaluate the effectiveness of the treatment. In general, people should remain on preventive drug treatment for at least 6 months. After that time, your provider will slowly reduce the dose while continuing to monitor the frequency of headache attacks. Side effects are fairly common with these medications. Drowsiness is the most common side effect and may be better tolerated when tricyclics are taken before sleep. Other side effects may include dry mouth, constipation, blurred vision, sexual dysfunction, weight gain, trouble urinating, heart rhythm problems, and dizziness. Blood pressure may drop suddenly when sitting up or standing. Tricyclics can have serious, although rare, side effects, including heart rhythm problems, which can be dangerous for people with certain heart diseases. These drugs can be fatal with overdose. Selective serotonin-reuptake inhibitors (SSRIs) work by increasing levels of serotonin in the brain. SSRIs used for prevention of tension-type headache include fluoxetine (Prozac, generic). Other antidepressants used for tension-type headache are mirtazapine (Remeron, generic), duloxetine (Cymbalta), and venlafaxine (Effexor, generic), which target both serotonin and norepinephrine. Although these antidepressants have fewer side effects than tricyclics, they do not appear to work as well for prevention of tension-type headaches. Tizanidine (Zanaflex, generic) is a muscle relaxant that is sometimes used for prevention of chronic tension-type headaches. In general, there is little evidence that other muscle relaxers are effective in treating tension-type headaches. Anti-seizure drugs, which are used for treating epilepsy, are sometimes used for prevention of tension-type headaches. They include topiramate (Topamax, generic), valproic acid (Depakote), and gabapentin (Neurontin, generic). Onabotulinumtoxin A (Botox) injections are used to relax muscles and reduce skin wrinkles. Botox injections are FDA-approved for prevention of chronic migraines in adults. However, the FDA has not approved Botox for treatment of tension-type headaches. Studies show conflicting evidence regarding the effectiveness of Botox for treating tension-type headache. Nitric oxide synthase inhibitors block nitric oxide, which may play a role in increasing nerve activity and in vasodilation that leads to headache. Researchers are studying these drugs for treatment of tension-type headaches. Psychological and behavioral techniques, and lifestyle changes, help reduce the intensity and frequency of tension-type headaches. These therapies can also enhance the effects of drug treatments. To date, relaxation training and biofeedback have the strongest evidence for improving tension-type headaches. Relaxation training uses breathing exercises, guided imagery, and other techniques to help relax muscles and relieve stress. Biofeedback uses a device to record a person's bodily responses (heart rate, surface skin temperature, and muscle tension). This information is then "fed back" to the person through a sound or visual image. Through this feedback, people learn to control their physical responses. In clinical studies, relaxation training and biofeedback, both alone and in combination, have led to improvements in tension-type headaches. Cognitive-behavioral therapy (CBT) teaches techniques to recognize and cope with life stressors. It can help people understand how thoughts and behavior patterns may affect their symptoms, and how to change the way the body responds to anticipated pain. CBT is often included in stress management techniques. Research indicates that CBT and stress management are most effective when combined with relaxation training or biofeedback. Massage can help relax tense muscles and may be helpful during acute headache episodes, however there is little evidence for long-term benefits. Although some small studies have suggested that spinal manipulation by chiropractors or osteopaths may be helpful for preventing tension-type headaches, there is insufficient evidence to confirm its effectiveness for reducing pain in tension-type headaches. Evidence is somewhat stronger on the benefits of spinal manipulation for people with headaches originating from nerve or muscular problems in the neck. Some researchers believe that tension-type headaches relieved by spinal manipulation are probably caused by neck problems. There has been little research on evaluating the benefits of physical therapy for tension-type headache. Sessions with a physical therapist might help in teaching specific exercises for strengthening and stretching muscles or improving posture. A physical therapist may also be able to advise on ergonomic changes for the workplace environment. Several reviews of clinical trials of acupuncture suggest that it may have some benefit for tension headaches. Acupuncture, hypnosis and biofeedback are all alternative ways to control pain. 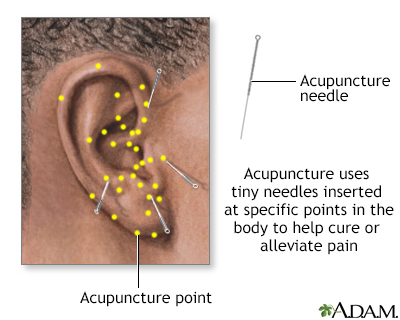 Acupuncture involves the insertion of tiny sterile needles, slightly thicker than a human hair, at specific points on the body. Good health habits, including adequate sleep, adequate hydration, healthy diet, and regular exercise are helpful for reducing stress. Quitting smoking is important in reducing the risks for all types of headaches. Heat or cold packs may be helpful. Some people report more relief with cold, others with heat. Packs can either be frozen or heated. Numerous herbal remedies are promoted for tension-type headaches. It is important that anyone taking herbal or so-called natural remedies be aware of the lack of regulations on quality and effectiveness governing their marketing. Generally, manufacturers of herbal remedies and dietary supplements do not need approval from the FDA to sell their products. Just like a drug, herbs and supplements can affect the body's chemistry, and therefore have the potential to produce side effects that may be harmful. Always check with your provider before using any herbal remedies or dietary supplements. Never give herbal remedies or dietary supplements to children without first consulting the pediatrician. Some people find relief using 2 drops of peppermint, eucalyptus, or lavender oil added to 1 cup of water. Soak a cloth in the solution and apply it as a compress to the head. Some studies suggest that magnesium supplements can help prevent migraine headache attacks, but there is little evidence that magnesium is helpful for tension-type headaches. Butterbur and feverfew are two popular herbal remedies for headache relief. The American Academy of Neurology deems butterbur as "effective" for migraine relief, and feverfew as "probably effective." It is not clear if these herbs are effective for tension-type headaches. Butterbur can cause an allergic reaction in people who are sensitive to ragweed and related plants. It is not certain if butterbur is safe for use during pregnancy. Feverfew may be dangerous for people who have a bleeding or blood clot disorder, or who take blood-thinning medications such as warfarin (Coumadin, generic). Feverfew can interfere with these medications and can affect the time it takes blood to clot. Pregnant women or women hoping to become pregnant should not take this herb, as it may potentially harm the fetus. Banzi R, Cusi C, Randazzo C, Sterzi R, Tedesco D, Moja L. Selective serotonin reuptake inhibitors (SSRIs) and serotonin-norepinephrine reuptake inhibitors (SNRIs) for the prevention of tension-type headache in adults. Cochrane Database Syst Rev. 2015;(5):CD011681. PMID: 25931277 www.ncbi.nlm.nih.gov/pubmed/25931277. Cerritelli F, Lacorte E, Ruffini N, Vanacore N. Osteopathy for primary headache patients: a systematic review. J Pain Res. 2017;10:601-611. PMID: 28352200 www.ncbi.nlm.nih.gov/pubmed/28352200. Crawford P, Kim M. Acupuncture for frequent tension-type headaches. Am Fam Physician. 2016;94(3). PMID: 27479630 www.ncbi.nlm.nih.gov/pubmed/27479630. Derry S, Wiffen PJ, Moore RA. Aspirin for acute treatment of episodic tension-type headache in adults. Cochrane Database Syst Rev. 2017;1:CD011888. PMID: 28084009 www.ncbi.nlm.nih.gov/pubmed/28084009. Ferri FF. Tension-type headache. In: Ferri FF, ed. Ferri's Clinical Advisor 2016. Philadelphia, PA: Elsevier; 2016:1201.e1-1201.e1. Freitag FG, Schloemer F. Medical management of adult headache. Otolaryngol Clin North Am. 2014;47(2):221-237. PMID: 24680490 www.ncbi.nlm.nih.gov/pubmed/24680490. Hershey AD, Kabbouche MA, O'Brien HL. Headaches. In: Kliegman RM, Stanton BF, St. Geme JW, Schor NF, eds. Nelson Textbook of Pediatrics. 20th ed. Philadelphia, PA: Elsevier; 2016:chap 595. Jackson JL, Mancuso JM, Nickoloff S, Bernstein R, Kay C. Tricyclic and tetracyclic antidepressants for the prevention of frequent episodic or chronic tension-type headache in adults: a systematic review and meta-analysis. J Gen Intern Med. 2017;32(12):1351-1358. PMID: 28721535 www.ncbi.nlm.nih.gov/pubmed/28721535. Loder E, Weizenbaum E, Frishberg B, et al. Choosing wisely in headache medicine: The American Headache Society's list of five things physicians and patients should question. Headache. 2013;53(10):1651-1659. PMID: 24266337 www.ncbi.nlm.nih.gov/pubmed/24266337. Probyn K, Bowers H, Caldwell F, et al. Prognostic factors for chronic headache: a systematic review. Neurology. 2017;89(3):291-301. PMID: 28615422 www.ncbi.nlm.nih.gov/pubmed/28615422. Rains JC, Davis RE, Smitherman TA. Tension-type headache and sleep. Curr Neurol Neurosci Rep. 2015;15(2):520. PMID: 25475495 www.ncbi.nlm.nih.gov/pubmed/25475495. Schoenen J, Sava SL. Tension-type headache. In: McMahon SB, Koltzenburg M, Tracey I, Turk DC, eds. Wall & Melzack's Textbook of Pain. 6th ed. Philadelphia, PA: Elsevier Saunders; 2013:chap 59. Simpson DM, Hallett M, Ashman EJ, et al. Practice guideline update summary: botulinum neurotoxin for the treatment of blepharospasm, cervical dystonia, adult spasticity, and headache: Report of the Guideline Development Subcommittee of the American Academy of Neurology. Neurology. 2016;86(19):1818-1826. PMID: 27164716 www.ncbi.nlm.nih.gov/pubmed/27164716. Stephens G, Derry S, Moore RA. Paracetamol (acetaminophen) for acute treatment of episodic tension-type headache in adults. Cochrane Database Syst Rev. 2016;(6):CD011889. PMID: 27306653 www.ncbi.nlm.nih.gov/pubmed/27306653. Voigt AW, Gould HJ 3rd. Chronic daily headache: mechanisms and principles of management. Curr Pain Headache Rep. 2016;20(2):10. PMID: 26780038 www.ncbi.nlm.nih.gov/pubmed/26780038.